Considering that the Vita has suffered from an unfortunate case of “let out to die” syndrome at the hands of Sony, there is something special about finding a Vita title that is not good simply because it exists on the platform, but rather good by virtue of its presentation, game mechanics and use of what makes the hardware unique. While incredibly polished and incredibly enjoyable in short bursts, Gravity Rush is unfortunately not the Vita title to be held up as such as exemplar. While use is made of the accelerometer and front touch screen that the Vita provides, these uses are not particularly novel and do not add much to the experience of playing the game. Areas of interest are well-marked in the game world. 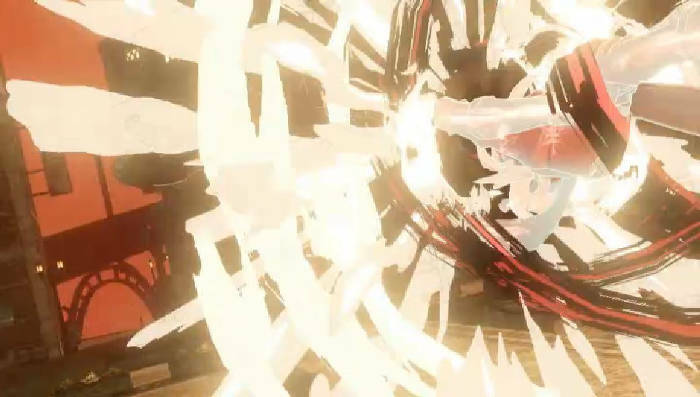 Gravity Rush sees the player taking on the role of Kat, a character who is suffering from some sort of memory loss, meaning that she does not know how she came to be in her location at the start of the game and has no idea why she seems to have a rare ability to manipulate gravity local to herself. This limited amount of backstory, while potentially construable as lazy writing, provides the sort of loose grounding in the nature of the game world to allow for the wonderful sense of discovery that accompanies light bumps of the Vita’s right trigger; bumps that can quickly change how a player expects to traverse an area or bumps that reveal that the gravity powers can be used in way that, perhaps, had not previously been envisioned. The first time that the way in which gravity changes will also make the player character “sticky” to sides of buildings and the like if they are aimed at using the reticle that appears after the first bump of the right trigger in normal-gravity state. A second bump and the world changes, causing Kat to accelerate in the direction the player points her in; a second bump and the player wonders “why can’t I do this?” This mechanic defines much of the game, and never once fails to elicit a sense of wonder unparalleled elsewhere. 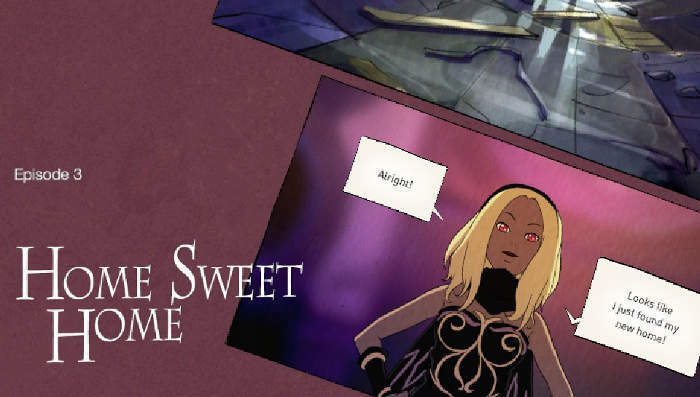 The presentation of Gravity Rush‘s story missions is fantastic. Aside from this ability to fling herself around, Kat is also able to use her ability to manipulate gravity to throw wooden objects and rocks in the world at foes; to slide around at high speeds; to super-charge aerial kick attacks; and to unleash visually stunning special moves unlocked as the game goes on. In the realm of the more conventional, Kat also has a series of physical, unaided kicks at her disposal for attack and a dodge which is used by swiping in the desired direction of travel on the Vita’s front screen. Here, unfortunately, is where things start to go wrong: the platforming and exploring of the game are fantastic simply because of the ability that the player has to zoom about anywhere with no concern for what the developer’s intended path for the player may have been. It is this freedom, however, that leads to the combat of the game being utterly terrible. Targeting enemies efficiently is made difficult by the wonderful pace with which Kat travels when manipulating gravity; when dodging, the player loses control either of Kat herself or the camera through necessity of moving a thumb from the analogue sticks; the sliding mechanic is fundamentally crippled by its use of the Vita’s lacklustre accelerometer for directional change with no override for any alternate input, as is provided where Kat is shifting gravity. While the game’s core mechanic of altering gravity to suit one’s whims is excellently implemented, everything else seems to have taken a backseat over the course of the development lifecycle. For the flaws of the some of the mechanics themselves, the game does a good job of introducing them. The structure of the game overall also seems somewhat confused: Gravity Rush seems to be stuck between providing a story-based experience while having enough short, challenge-type activities to make it suitable as a portable pick-up-and-play game. Both elements of this are implemented well in separation, with the challenges being bite-sized while not trivial and the story being equal parts charming and touching at various points of its progression. 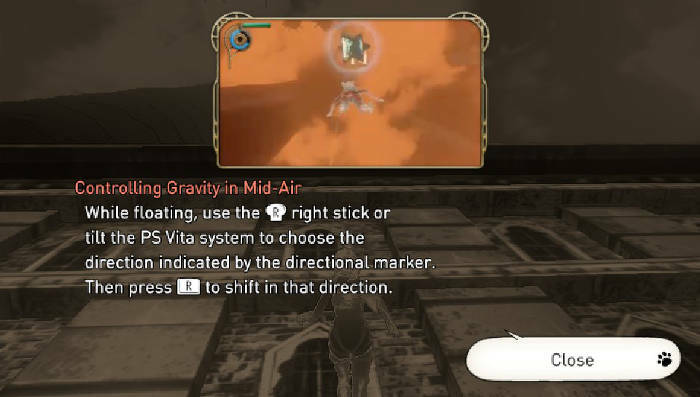 The difficulty comes in the fact that the two, when side by side in the world as they are in Gravity Rush highlight certain flaws that the game does have. If a player is particularly diligent in picking up gems in the early part of the game, it is possible for them to unlock and play challenges that rely on game mechanics that are explored and explained to the player later on in the story half of the game, leaving them with little idea with what to actually do. As well as ruining the great pacing of the story missions’ drip-feed of mechanics, it also makes the game look poorly thought out, which is a shame for a game so hyperstylised and incredibly consistent in its art design. On top of this, the long loading times for retrying a challenge after completing it are a disincentive for long-term play when hunting for the gold-rating for each challenge. The RPG-lite elements of the game, whereby certain characteristics of Kat’s can be enhanced in exchange for gems, further serve to undermine the “challenge” involved with the challenges: if a player waits until they complete the story missions to go back to the challenges, there is every chance that Kat will be overpowered relative to the challenge to the point of completely undermining it. Had the game chosen to wholly be a series of challenges or the main story component, it would have been much stronger that the hodge-podge that made it into the release. The game is lovely to look at. It must be made clear: Gravity Rush is a beautifully presented, wonderfully realised game. It is, however, let down by a lack of direction and series of supporting mechanics that do not in any way do justice to the primary mechanic of messing around with gravity. As far as games that deal with the manipulation of natural forces to one’s own ends go, however, Gravity Rush is a worthy addition and worth experiencing only for the way in which it celebrates the ridiculous nature of its own primary mechanic by letting the player do so much with it.